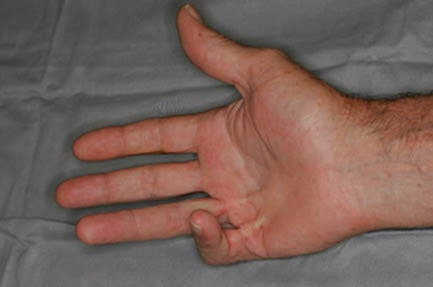 Dupuytren Disease is a thickening of the fascia, or layer of tissue beneath the skin. Over time, this thickening creates characteristic nodules or cords that wrap around and tighten the tendons, causing the finger to gradually develop a contracture. Depending upon the severity, one or more fingers may begin curling into the palm. If these contractures are severe enough, people are unable to open their hand, lay their hand flat on the table, put their hand into a glove, or shake hands. Thick bands, cords, nodules in the palm of the hand. Inability to fully straighten the fingers or lay the hand down flat on the table. Typically, Dupuytren Nodules are not painful; However, if the thickening tissue presses on a nerve, or occasionally during the initial development of the cord/nodule, pain may be present. Initially, unless there are any complications, as the nodule forms, treatment is usually considered to be "wait-and-see". Perform a Needle Aponeurotomy - a procedure in which a needle is inserted and scraped along the cord to sever it. Perform an Enzyme Injection & Contracture Release - inject an enzyme (Xiaflex) to soften the cord and then, several days later, physically break the cord to release the contracture. Use of a hand brace, splint or orthotic at night for a period of 12-16 weeks to hold the fingers straight to maintain the mobility that the physician achieved following surgery, needle aponeurotomy or enzyme injection (similar to using a retainer to maintain the position of teeth once braces are removed). Use heat packs to control more chronic pain, to relax the muscles, to increase scar flexibility. Wearing compression or Isotoner gloves at night may help control swelling. Exercises to regain mobility, maintain the mobility of the joints that the physician achieved with the medical procedure, and to glide the tendons. Gradually regaining the strength of the hand, wrist and arm. Modalities such as ultrasound, electrical stimulation and paraffin application may be helpful to reduce pain and inflammation. Techniques to reduce swelling such as using a compression glove or sleeve, electrical stimulation or cold packs. American Society for Surgery of the Hand (ASSH) -Website Information, Also, provides a link to a video.